It’s true. We’re in October. And for many people, that means that the fall has officially started. Where does the time go? It feels like we were just celebrating the warmth and sunshine that comes along with the summer season, and now we’re getting all set for Thanksgiving and Halloween. We’re also getting set for much colder weather in the coming months! Think about the fractional laser superhero to remove years and signs of unwanted aging. For some people, that means putting away the sunscreen. But doing so is definitely a no-no. Not only is the sun not going anywhere – don’t let the drops in temperature fool you – but the cold weather is a lot harsher on our skin. If you don’t want your skin drying out, it will be important to take steps to keeping it regularly moisturized. With that said, sometimes there isn’t much we can do to prevent skin damage. As we all know, aging is inevitable. And with aging comes the loss of our skin’s natural collagen and elasticity. There are, of course, other skin issues that we can’t help but endure with the passing of time. Many of us know them all too well. Acne, brown spots, melasma, moles, skin tags, saggy skin, sun damage and wrinkles make up the laundry list of enemies to our skin. But thankfully, there is a superhero that is able to effectively battle all of the above. The Fractional CO2 Laser has the ability to vaporize water to remove layers of problem skin and stimulate the growth of new collagen. Known as a skin tightening laser, the Fractional Laser Superhero has the ability to take years off of the appearance of patients who undergo its treatments. And here’s how it works. The Fractional CO2 Laser heats the water that our skin cells are made up of. This allows for the gentle removal of skin cells that enable the fresher layer of lower lying skin to be revealed. In addition to unveiling newer, younger looking skin, the laser also helps to stimulate the growth of new collagen. This helps to maintain that smoother, younger look. 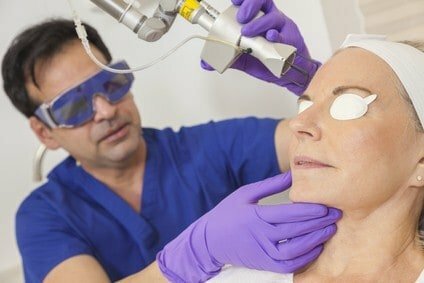 Another incredible aspect of the skin treatments that use the Fractional Laser Superhero is that they generally take no more than twenty minutes to complete. The only other time that the patients spend at the clinic is to allow for numbing cream to be applied to the treated area. Of course, this is done before the laser treatment commences. Once it is complete, a healing ointment is applied to soothe the treated skin. This YouTube video demonstrates the effectiveness of treatments using the Fractional Laser Superhero for Skin. In it, a patient named Kate describes her eagerness to undergo treatment to address the lines around her mouth as well as a few skin tags on her face. The video documents the seven day process that Kate undergoes to achieve her fresh new look. “Thrilled” is just one of the words Kate uses to describe her feelings about the results. “Day seven feels wonderful and I’m looking forward to down the road every day looking better and better,” she exclaims. For more information on how the Fractional Laser Superhero CO2 can help with your skin conditions, call DermMedica toll free at 1-866-861-3070, or if you are in Kelowna, call 250-868-3070.